The beautiful Beatles song seems to be the lifelong dream of Ernesto Alvarez Alpízar, a loquacious man in his 80s who, besides devoting all of his time to the “exotic” profession of growing strawberries in Cuba, has a biography, which more than a true life story, seems like the plot for a melodrama. With a childhood marked by hardships and privations of all kinds; kidnapped by his father, who struggled with the child’s maternal grandmother for custody of the boy; motherless very early in life; still illiterate at the age of 11 yet a high-school graduate and training to be a teacher at 15; a jobless teacher; an instructor of shorthand, typing and secretarial courses, young Ernesto, black and poor, took advantage of the possibilities opened to the people of his condition in post-1959 Cuba. Giving up his dream of studying medicine, he set out to Romania in the early 1960s to be trained as a mechanical engineer specializing in oil. In the distant Romania, however, he decided to change to Agronomy. The field practices put him in touch with the cultivation of strawberries, and then and there a love that has lasted to the present day was born. At 85 years old, daybreak sees him in the field caring for his crop. But let’s leave Ernesto to tell this part of his story. I graduated in Cuba, and I was assigned to a national group involved in the cultivation of exotic fruits. I was sent to the province of Sancti Spiritus, specifically Banao, which has a microclimate favorable to this kind of crop. I worked there in a program initiated in 1965 at the request of Fidel Castro. There, I devoted all the time I could spare to study and research on strawberries and their cultivation, helped by the documentation I had brought from Romania. From Banao, I was transferred to San Antonio de los Baños, in today’s province of Artemisa, because they wanted to promote the cultivation of strawberries in the land surrounding the Batalla de Jigüe Junior High School. But I realized they wanted to cultivate over three acres, which requires thousands of plants, and we didn’t have enough. I travelled to Mexico, but discovered that the phytosanitary conditions were not good. I continued to Chile, where the situation was the opposite and there we bought the plants from a dealer who had brought them from California. When we planted them in San Antonio, we obtained good yields. I tell Alpizar—how he is called by most—that at that time all the young people wanted to do voluntary work in San Antonio, which was the only chance of eating fresh strawberries, given that the entire production went to the dairy industry. It was the golden age of Cuban ice cream, when you could find portions of strawberries, pineapples or peaches in the ice cream. He smiles, perhaps remembering the mischievous students who were always ready to eat more strawberries than the ones they were able to pick. After some time working in San Antonio de los Baños, I was transferred to the Academy of Sciences to work on adapting this crop to tropical and subtropical conditions, and since then I have devoted my life to research and studies, especially phenological studies, to learn how these plants grow during different months of the year. I ask him, based on his experiences, what he would recommend to those who are new to this delicate crop. In countries where strawberries are traditionally grown, like the US, Japan, Spain, China, Ireland, Morocco, Italy, Israel and Poland, they select the stock and in the autumn, the stolons, or runners as they are also called, are extracted from the earth, prepared and put into cold storage at -1° C. Those who are interested in encouraging the growth of strawberries, have to go to the cold store to buy the runners. According to my studies, in tropical countries it is preferable to make stock planting and force the runners to take root in bags filled with approximately eight 8 ounces of organic substrate and soil, and then transplant them. I ask Ernesto if the harvest season in Cuba is the same as in temperate climates, between June and August. According to my experience, planting should take place in November to ensure production from January through May. But Alpízar’s life is not only about strawberries. I live in the town of Antonio de los Baños and I work a small farm owned by the Vicente Perez Noa Cooperative, for which I plant flowers, especially mariposas Cuba’s National Flower. The strawberries that I grow, however, I sell on my own. I take small amounts personally to the homes of my customers. I also grow apples. 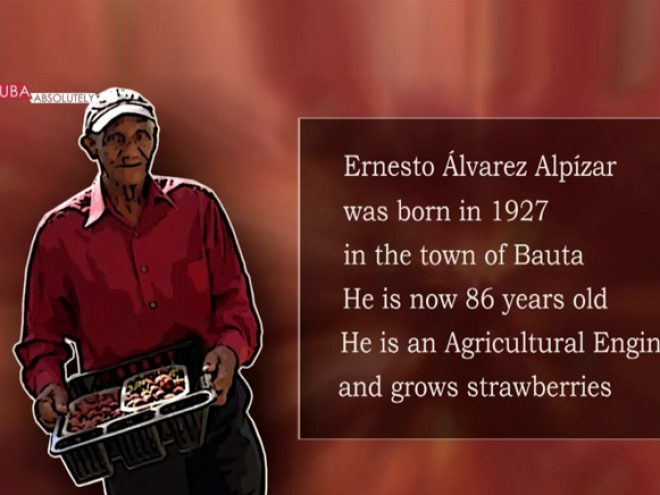 Savoring the big, juicy strawberries that Alpizar grows, I ask him how he prefers to eat them. This is an ideal fruit for people who suffer from diabetes, like me, given its very low concentration of carbohydrates, but I like to sprinkle them with a little bit of sugar, and I hope my doctor never finds out. Strawberries are also recommended to prevent fluid retention given their antihypertensive, anti-inflammatory and antioxidant properties; as a booster to the immune system; to regulate cholesterol levels in the blood… But nothing compares to the sheer delight of eating strawberries for their heavenly taste.